Wood Floor Installation | San Diego Ca - Joe's Hardwood Floors Inc.
Let us provide the best products and staff for all of your wood flooring needs. Joe's Hardwood Floors Inc. in El Cajon, California, offers wood floor installation, sanding and refinishing, water restoration of wood floors, moisture barrier for wood floors, wood floor supplies, and wood floor inspections for the greater San Diego Area. If you need a wood floor installation in San Diego, CA, our flooring and installations are covered by a full warranty (terms and conditions of warranties are available upon request). When your floor is damaged from water or time, let us restore it to its original beauty. After our professionals inspect your floor, they can seal it to prevent future damage. We offer free estimates by appointment. Joe's Hardwood Floors commitment to customer service means that we guide you through our flooring process and answer any questions that you might have. Whether you have an old floor, a new floor, a contaminated floor, or any other type of wood floor, there is nothing that we can't handle. 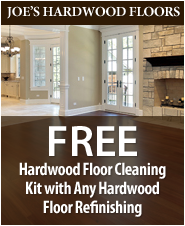 Let us provide you with comprehensive services for your hardwood surfaces. Our store provides everything from sales to selection to installation. We specialize in wood. To start with, our store offers an abundance of selections from trusted brands. When choosing flooring for your home, hardwood makes an excellent choice. Not only does wood enhance the ambience of your space, it also boosts the value of your property. Wood is a durable flooring surface that goes with everything. The warmth and character welcome family, friends, and neighbors to your home. Did you know hardwood is also a healthy option for your home? This is because wood leaves no place for allergens, such as dust, dirt, and mold, to hide. Reducing the allergen level in your house makes the indoor air so much easier for all to breathe, especially those with allergies and respiratory problems. Cleaning wood is simple. Sweep in the direction of the grain, using a microfiber mop head to remove dust, dirt, and pet hair. To restore the gleam, use a microfiber string mop with a little wood floor cleaning solution. These easy steps will keep your flooring looking handsome. If you adore the look of wood but would like a choice that mimics plank and costs less, you can opt for a wood laminate installation. After our hardwood laminate installation, your floor will resist wear and tear as well as scratches. Check out some of our top-quality work here. Contact us today for sales and installation of hardwood flooring. We proudly serve customers in San Diego, California, and the surrounding area.